SITTIN' IN AGAIN AT THE BLAISDELL: Reunion concerts don't get any better than Loggins & Messina's excellent two-hour, 45-minute concert Friday at Blaisdell Arena. 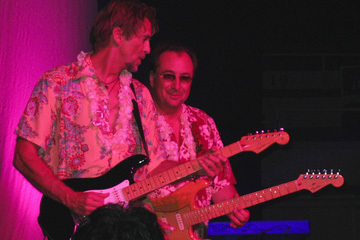 Kenny Loggins, left, and Jim Messina played everything their fans could ask for, from "Watching the River Run" and "House at Pooh Corner" to "Angry Eyes," "Your Mama Don't Dance" and "Danny's Song." They looked as though they were having a good time, did justice to all their best-known songs and got great support from their band. L&M closed their 47-city "Sittin' in Again" tour last night on Maui. WELCOME BACK: State Sen. Clayton Hee, second from left, welcomed Jim Messina, center, and Kenny Loggins to the backstage party hosted by Emme Tomimbang, right, before the concert. 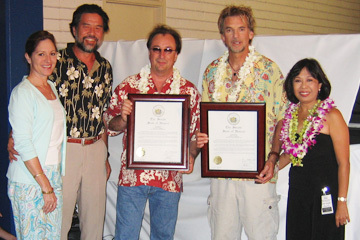 Lynn Waters joined Hee in presenting the duo with framed proclamations commemorating their long-awaited reunion concerts in Hawaii. 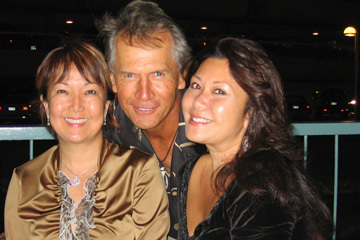 MEMORIES OF A VW: Kimo Kahoano enjoyed Emme Tomimbang's pre-concert L&M party with Donna Walden, left, and Hinkie. Hinkie volunteered that "Loggins and Messina reminds me of all kinds of things I've done ... and my ex-boyfriend's '68 Volkswagen van." 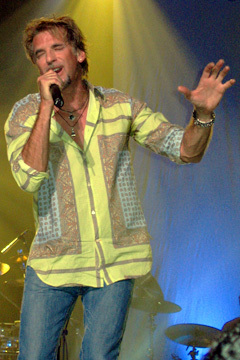 LOOKING FOR SOME PEACE OF MIND: Kenny Loggins thrilled fans down front when he came to the edge of the stage in the first half of the show. He and Messina entertained the crowd after intermission with stories about their early experiences opening for other acts. 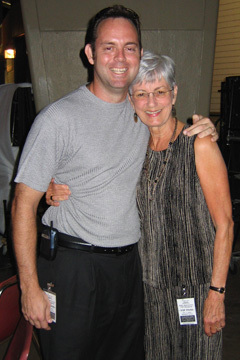 REMEMBERING 'JFL': The late John F. Leonard, the concert promoter who brought Loggins & Messina to Hawaii in the 1970s, was represented backstage by his son, Chris, and ex-wife, Jackie. Chris went deep into his father's JFL Concerts archives to give the duo copies of the posters from their 1970s shows here. 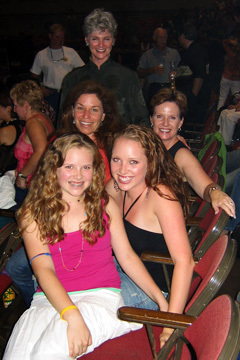 A NEW GENERATION OF L&M FANS: Marissa Freeman, front left, and her sister, Rachael, front right, attended the concert with Gwynn Ellicott, back left, Marianne Dymond, top, and their mother, Genevieve Freeman. Genevieve saw all the Loggins & Messina concerts here in the 1970s, and Rachael says that she and Marissa are born-and-raised L&M fans. » Can't we all just get along?